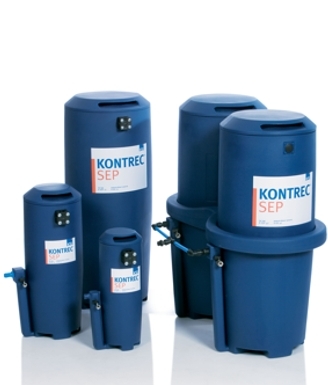 The KONTREC® SEP is the safe and economical solution for treating condensate, so that it can be discharged into the public drainage system without problem and in accordance with legislation. It is installed as part of the compressed air system and reduces the oil concentration of the condensate to a permitted level. One special feature of the KONTREC® SEP is that it can not only separate petroleum fractions from the condensate but also synthetic oils and polyglycols. It can also separate stable emulsions. It can therefore be used with all types of condensate drain.